Hi everyone! Wow, admittedly my blog has been all over the place this month with my DT posts for Dare 2B Artzy, between Halloween and Christmas. It is that time of year however – Pumpkin Spice everything and Halloween decorations and costumes just two aisles down from the Christmas ornaments that are slowly being put out. I love fall and the holiday’s though. Today, I’m taking a step back from that to share a card that I made for my BFF, David to give to his aunt. The base of this card was actually from a kit from a company called Queen & Co. I think I ordered the kit basics from Blitsy.com. The kit consisted of some pre-cut white card bases A2 size (3 or 4), a precut layer of foam that had adhesive on the back and front that was cut with butterflies, a piece of acetate and some little sparkly gems in a rainbow of colors and a top layer that was also precut with butterflies that was supposed to go over the acetate. All of the butterfly designs were pre-cut but the kit also came with the A2 size butterfly die so that you can cut/create more cards/projects. I purchased this kit because I’d never created a shaker card with a dimensional foam layer and I thought this might be a good kit to figure out the mechanics of putting together this type of card and it was. Plus it did save time not having to cut all of the layers – sort of. More about that in my post. I’d had my kit for several months and just hadn’t had the time to do anything with it but one night we were going over to my BFF’s house to have dinner and watch Fear the Walking Dead. I usually take my stamps and color so I can “listen” to Fear the Walking Dead because I can’t watch all of it cause it kinda eeks me out a bit. I decided to take the kit and have my best friend put the card together for his Aunt. I thought that would be something nice he could do for her since she is very ill with what the doctors believe is cancer and has refused any kind of treatment or testing. I showed him the kit and together we figured out how to put it together. I let him decide the colors of gems and let him fill up the die cut holes where they would go before I put the top layer of acetate on to seal it up. I told him that I would decorate the front of the card and color it or something and then he could give the finished card to his aunt. 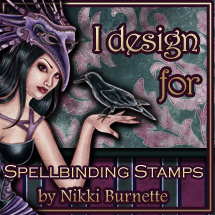 However, when I went to use the die cut cardstock cover for the front of the card, I found it impossible to keep the ink for my stamps from smearing and smudging on the cardstock. It was a shiny heavy-weight cardstock, but I couldn’t find any ink that would actually dry on the surface. I tried every ink I had in my arsenal and even tried heat setting it. Nothing really worked so I scrapped the cardstock that came with the kit and decided to use the die that came with the kit instead to just make my own cover. I cut a piece of Neenah Solar White cardstock in 110 lb weight to about 5 x 7. Originally, I’d planned on simply stamping and coloring the front, but decided I wanted something a bit more vibrant and colorful. Instead I used my Ranger Liquid Pearls in Hydrangea (purple) and Pumpkin (orange). The Liquid Pearls work great alone or also mixed with water. For this project, I squeezed a generous amount of Liquid Pearls on my craft mat in both colors and spritzed both colors with quite a bit of water. You’ll want the consistently of paint, but you don’t want to add too much water or it will bet a bit too runny to work with. Also, you should consider the cardstock you’re using as well as you may not want to add too much water unless you’re using watercolor paper which would stand up better to more water and medium. Using two separate paint brushes, I started brushing on the Pumpkin color Liquid Pearls from the bottom in even strokes. Taking the paint about to the half way point on the card where the paint becomes a bit thinner at the center. When I was happy with the bottom, I did the same on the top except using the Hydrangea color and bringing it to the half way point of the card as well.In the middle you’ll get a blending of the two colors. I’d say that with some colors you’d need to be a bit careful so you don’t have a muddy color in the center. I set my painted panel aside to fully dry so I could die cut it. Next, I started working on my flowers for the front of the card. I had this adorable flower stamp set called Pinwheel Daisies from JustRite Papercrafts. I found this stamp and the matching die set at the Scrapbook Expo in Denver earlier this year and fell in love with it. I thought it would be perfect for the front of the card. I figured out which of the flowers I was going to use for my card and stamped them with some Versamark ink and then used some Black embossing powder on it and heat set it. Once it was set, I used my Copics to color in the flowers with some bright, bold colors. Keeping the color scheme consistent with my card front and pulling from the colors of the gems that are in the shaker. Once my flowers were colored, I was able to use my matching dies to cut them out. I’m always grateful when I buy the matching dies – especially on small, intricate or detailed stamps because it really is a challenge to try to fussy cut those things. I’ve made that my new rule, if a stamp set is super small, detailed or has a lot of smaller stamps – I get the matching die if there’s one available. It may cost a bit more, but it’s so worth the time you save. With my flowers colored and cut, I went back to my card front and tested it to make sure it was dry. The Perfect Pearls dries pretty quickly, but I did run my heat gun over it for just a couple of minutes just to make sure it wasn’t tacky in some places. Once done coloring, I was finally ready to emboss my panel. To do this I used one of my Next Level embossing folders from We R Memory keepers. For this card, I used the folder called Wave. These really are a great way to make your cards pop with texture. Each package has two different folders in it and they sell for between $6-$10 on Amazon. I just love them. I ran the panel through my Evolution machine in the embossing folder and it comes out with a gorgeous quilted look. Next, I grabbed the butterfly die that came with my card kit and ran it through my die cut machine to create the cuts that would line up with the foam in the shaker. Confession: I actually cut the panel facing the wrong way the first time because I wasn’t paying attention to the way I placed the die when I ran it through the machine. My little error led me to have to recolor a new panel with my Perfect Pearls again and then re-emboss it as well. UGH! It happens. I did keep the other panel because I can use it for another project that doesn’t need a shaker so not a total waste. After my little detour of trial and error, I finally had a finished colored, embossed and cut panel that was ready to be adhered to my card base. Since the panel was being adhered to the sheet of acetate, I used my 3D Crystal Laquer glue to put glue down on the acetate being careful not to get too much around the edges fo the butterflies. I lined up my card front and put it in place over the acetate so that everything lined up beautifully. Finally I was ready to place my colored Pinwheel Daisies on the front of my card. I used the extra butterflies from the die cut panel and glued some of those in place to add some dimension to the card front and make it look like they were breaking free and flying off the card. For my sentiment I stamped a simple Hello and heat embossed it with some hot pink embossing powder. Inside the card, I stamped the Thinking of you sentiment. Both of those sentiments were from the My Favorite Things Card Kit Beautiful Blooms. I love the clean and simple font that the stamp set has. I actually picked that kit up from my friend Carisa over at Inky Fairy Designs when she was having one of her awesome stamp de-stash sales. I love, love, love how this card turned out. I was thinking that it was a bit of a cheat to use a kit for this card, but in reality it turned out great because I actually was able to turn it into something really vibrant and pretty for my BFF to give to his aunt. I will say having the kit to see the mechanics of the shaker card was pretty cool. I could totally make these or something similar on my own now that I know how everything goes together. Hope you enjoyed my card today. It was a bit of a mini-break from all the Halloween, Thanksgiving and Christmas cards/inspiration that are out right now.